Despite the overwhelming popularity of WordPress, Drupal is still one of the internet’s most popular open-source content management systems. Because it’s not the most popular CMS, finding a decent theme to use for your website can be difficult. The best themes should be clean, professional, and responsive on both desktop and mobile devices. Below is a list of 21 of the best Drupal themes currently available for purchase. 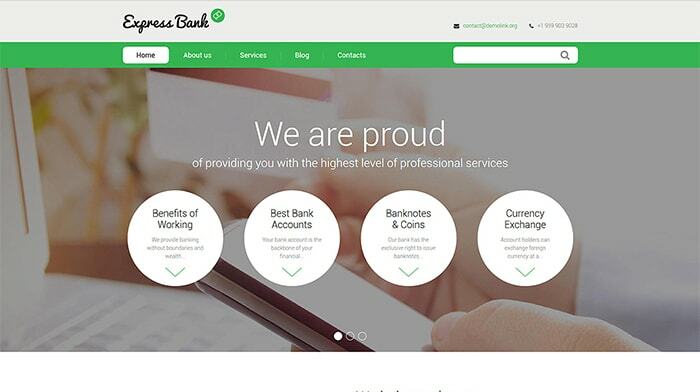 This theme for banking and financial websites has clean professional design. Green elements placed over the fair layout are pleasant for the users’ eyes. Round banners impart the theme a modern look. Customers’ testimonials as well as Google Maps, where you can indicate your company physical location, impart even more reliable image to this corporate website. 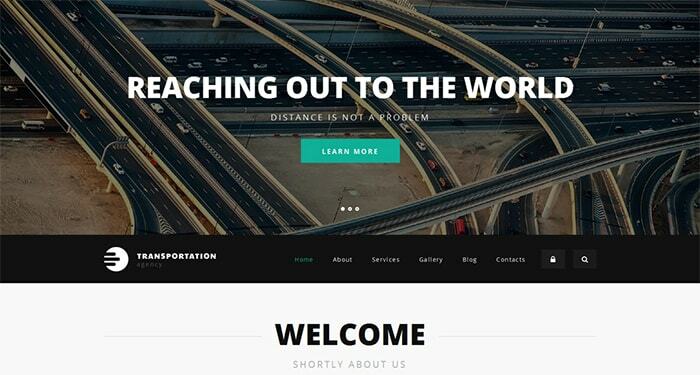 This theme for logistics and transportation websites has an appealing, dynamic layout. Slider captures visitors’ eyes and encourages them to explore the website further. Main menu has lowered position on the page. Progress bars help the author illustrate the complicated information, making it simpler to comprehend. Parallax effect adds depth and perspective to the layout. The third entry on this list is, in many respects, the quintessential minimalist Drupal theme. Its simple tabbed layout allows for a website that is both clear and efficiently structured, and its sleek icons fit perfectly with the overall theme that the designer was aiming for. By far one of the most highly -rated themes currently for sale on ThemeForest, Webstudio is, for all intents and purposes, pretty much everything that you could ask for from a Drupal design. With an interface that combines the more contemporary tabbed layout with the traditional navigation bar coupled with full responsiveness across desktop, mobile, and tablet, it isn’t hard to see why. The most aesthetically -appealing aspect of leaftree’s SpecialOne theme is the clean -cut chunky icons that are almost reminiscent of a smartphone interface. When these are presented alongside a clean and professional blue -on -white interface, the whole package really starts to look rather nice. Featuring a visually stunning full -page grid gallery, Refaktor’s Other theme is an ideal choice for those looking to set up an attractive and engaging online photography portfolio. The simple and non -intrusive side navigation bar makes traversing pages easy and allows the user to focus on the most important aspect: the photos. If you’re a real estate company looking to definitively announce your web presence with a sleek and professional site design, you can do a lot worse than aviators’ Realia theme. Featuring an extensively customisable main page made up of an interactive map for listing your properties overlaid with adjustable sliders on either side, this layout is clean -cut and mindblowingly simple to use. A professional appearance and a minimalist appearance are often two concepts that go hand in hand, and tabvn’s Finesse theme is a hugely effective marriage of the two. The orange -on -white colour scheme is incredibly easy on the eyes and the ensures that your important content will not go unnoticed. Teal is a colour that really doesn’t get enough love nowadays, but fortunately CMSSuperHeroes’ Consilium is here to remedy that. The almost -aqua shade of gorgeous bluey -green contrasts excellently with the white background, and with so much space to fill with content running out of room is never a worry. Another one for all of the aspiring photographers out there, responsivecoil’s MY FOLIO eschews the traditional full -page grid approach in favour of an incredibly effective tiered system that intersperses your content boxes amongst the featured images. It’s retina -ready, too, so your treasured snaps will look glorious on a smartphone screen. An awful lot of themes boast the sliding image tabs, but tabvn’s second entry on this list, Magnetto, takes it to a whole new level. With clever animations that pop in when you scroll to them, you can be sure that users are going to notice what you want them to notice – they’re even touch-enabled for full smartphone responsiveness, too. When it comes to effective web design, colour is quite often something that is best used sparingly, and with the Kalypso theme, refaktor has thoroughly embraced this idea. A calm greyscale theme lightly dashed with smatterings of blue stays well away from gaudy territory, and the stickied traditional navigation bar on the left is a nice touch that will increase usability tenfold. Whether you’re a fan or lighter themes or darker themes, DDamir has you covered. Designmd 01 comes with two interchangeable designs to suit the mood of your website, each one fully-featured with all of the CMS essentials including the designer’s own take on a pretty snazzy navigation bar that blends the traditional with the more contemporary drop-down list alternative. Windows 8 really revolutionised the world of operating system interfaces with its new “Metro” desktop, and this Drupal theme by refaktor brilliantly captures the effectiveness and ease-of-use of the Windows 8 desktop. With brightly coloured content boxes arranged in the signature grid style followed by boxes with novel sliding images, this is a brilliantly usable representation of Microsoft’s style. Remember when Web 2.0 was first dawning on the internet and the in -thing was themes with sheen on everything? Well, with Smooth, themebiotic harks back to those halcyon days but this time there’s no risk of over -saturation. Sparing gloss mixed with subtle blacks and greys equals an effective, professional -looking theme. It’s amazing how much something as simple as a single colour can impact on the way that a theme is perceived, and tabvn’s Danat is no different. The unobtrusive blocks of lime green are beautifully bright and refreshing on the eyes, ensuring that your end users will want to come back again and again. Simplicity in its purest form. Keeping the whole “refreshing” theme going, StyleMultimedia’s Style Vintage takes the concept and elevates it to stunning new heights. The ice cream theme makes use of gorgeous pastel colours that are almost capable of making you salivate following even the slightest glances. Clean -cut and full -featured, this is definitely the one for you if you want to keep it bright and breezy. If you’re looking for a surefire way to help your business rise above the competition, you need look no further than refaktor’s excellent Expressa theme should be your first port of call. A simple, no -frills approach to this e -commerce layout’s design ensures that your customers are going to be focused almost entirely on the most important aspect – the products for sale. We’ve already covered a couple of beautiful portfolio layouts, but neither of them are quite like tabvn’s Visia. A tiered layout makes it easy to distribute all of the important information that you need, and each tier is distinctly coloured to minimise confusion. Throw in some very sleek scrolling animations, clever mouseover effects, and an all -round feeling of professionalism and you have a very effective portfolio template indeed. In this age of smartphones that we currently live in, retina optimisation is a significant plus point when it comes to Drupal themes – rest assured, then, that tabvn has ensured that the wonderfully minimalistic and concise layout of Astrum is ready to be viewed at maximum quality on a handheld screen. Throw in some seriously smart video embedding support in the main content slider, and you’ve got a theme that packs a serious punch. Last – but by no means least – on our list is an entry from drupalexp, coming in the form of the seriously smart -looking Evolve. It’s main innovation comes in the form of a small loading bar travelling across the bottom of the ever -changing content slider, so your visitors will know just when they can expect to see something new. The template is full of classy, professional animations that will give your company that little bit of je ne sais quois necessary to really claim its place in the busy online market.